When compared to winning the jackpot? Despite there being major doubts about the legitimacy of his research, even if we take 150 deaths per year as verbatim, and divide this number by the rough number of people old enough to enter the lottery in countries which have coconut trees, your chance of being killed are only about 1 in 270,000,000. That’s far less likely than your chances of being eaten by a shark or winning the Mega Millions jackpot (which is now at $304,000,000 - but only if you bet at Lottoland)! 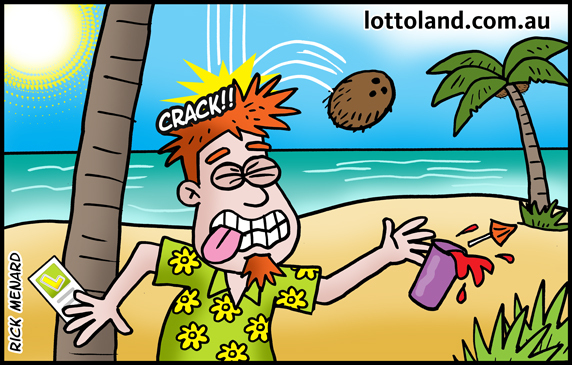 So if you’re on vacation in the tropics this year and you do get struck on the head, first be thankful you didn’t back up Barss’s hypothesis and then think about going and buying a lottery betslip.